On Thursday, many celebrities were sharing photos of their Thanksgiving celebrations on social media, but it was Mariah Carey whose holiday ‘gram got extra attention. The singer posted a festive photo on Instagram of herself holding a pie and can of whipped cream while wearing a plunging lace-up bodysuit and skinny jeans. “#Festivating!! #happythanksgiving ?” she captioned the pic. A few eagle-eyed followers noticed something was off though—like the distorted mirror up by her shoulder, and the warped cabinet by her right knee. 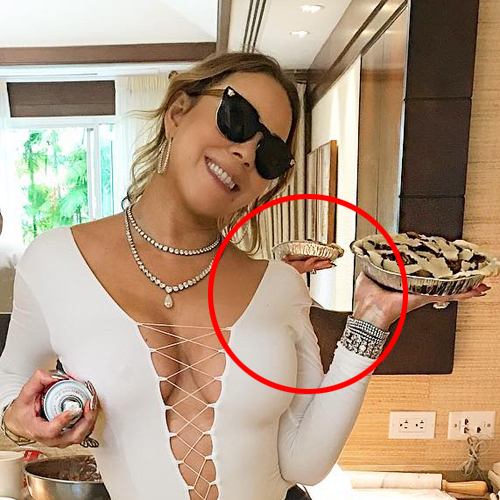 People quickly started calling Mariah out in the comments, pointing out these tell-tale clues and accusing her of some egregious Photoshop editing. “That’s got to be some of the worst photoshopping I’ve seen!” wrote one follower. “Should the cabinet door and mirror bend like that?” another commented. Others came to Mariah’s defense, downplaying the doctoring and noting, instead, how happy she looks. “Let her be she looks happy,” wrote one fan. It seems Mariah isn’t letting the haters bring her down during her family time in Hawaii—she’s still sharing pics as the holiday weekend continues and hasn’t deleted the offending post, despite all the fiery backlash it’s received. And why should she? We all know she isn’t the first celebrity to get a little fast and loose with their Photoshopping, and she certainly won’t be the last. So let’s just listen to “All I Want for Christmas Is You” and resume our appreciation for her majesty Mariah.